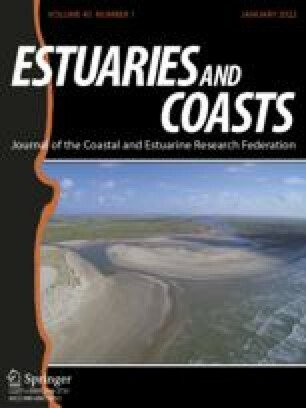 Buoyancy input as fresh water exerts a stratifying influence in estuaries and adjacent coastal waters. Predicting the development and breakdown of such stratification is an inherently more difficult problem than that involved in the analogous case of stratification induced by surface heating because the buoyancy input originates at the lateral boundaries. In the approach adopted here, we have adapted the energy considerations used in the surface heating problem to describe the competition between the stabilizing effect of fresh water and the vertical mixing brought about by tidal and wind stirring. Freshwater input induces horizontal gradients which drive the estuarine circulation in which lighter fluid at the surface is moved seaward over heavier fluid moving landward below. This contribution to stratification is expected to vary in time as the level of turbulence varies over the tidal cycle. The density gradient also interacts directly with the vertical shear in the tidal current to induce a periodic input to stratification which is positive on the ebb phase of the tide. Comparison of this input with the available stirring energy leads to a simple criterion for the existence of strain-induced stratification. Observations in a region of Liverpool Bay satisfying this criterion confirm the occurrence of a strong semidiurnal variation in stratification with complete vertical mixing apparent around high water except at neap tides when more permanent stratification may develop. A simulation of the monthly cycle based on a model including straining, stirring, and the estuarine circulation is in qualitative agreement with the main features of the observations.